The Indian whistling duck or Lesser whistling duck (Dendrocygna javanica Horsfield, 1821) is the smallest member of the ducks belonging to the group called “dendrocygna”, belongs to the order of the Anseriforms (Anseriformes), to the family of the Anatids (Anatidae). The name of the genus Dendrocygna comes from the Greek “dendron” = tree and from the Latin “cygnus” = swan and therefore means “arboreal swan” in reference to the arboreal habits of most of the species belonging to this genus and in reference to the peculiar look of these ducks which in some way recall the small swans. The name of the species javanica refers to the land of origin: eastern Indies, Java Island and nearby areas. Known also with the name of Indian whistling duck, the species is abundantly present in the tropical jungles and in the plains swamps of the Indian Subcontinent and of great part of the sub-tropical area of Asia (south-eastern Asia), with distribution expanded in India, Nepal, Sri Lanka, Malaysia, Indonesia, Myanmar and China. The species is mainly sedentary and moves only in function of the water availability; the northern population of China is conversely migrant abandoning the reproduction zones in winter. In poorly rainy and particularly dry years, huge dispersive movements can take place. The species is numerous in the central-southern plains of Thailand and in Sri Lanka. Until the end of the 19th century, this species was present, although in scarce number, in Japan; probably due to the intensive hunting they have disappeared from Okinawa and from the Ryukyu Islands. It frequents a vast variety of humid locations and particularly those rich of vegetation such as ponds and river basins covered by the leaves of lotus (Nelumbo nucifera) or in flooded rice fields, ideal are the wet areas surrounded by some trees where to perch. Far less frequented, even if not completely avoided, are the ample rivers, the zones of open waters having no vegetation, the estuaries, the brackish coastal lagoons and the sea. As described for the other ducks belonging to this genus (Dendrocygna spp. ), the difference between the sexes is not evident; also if sometimes shapes rather heavier and rounded (of the abdomen) of the pre-spawning (or spawning) females can permit to distinguish the sexes to an attentive observer. 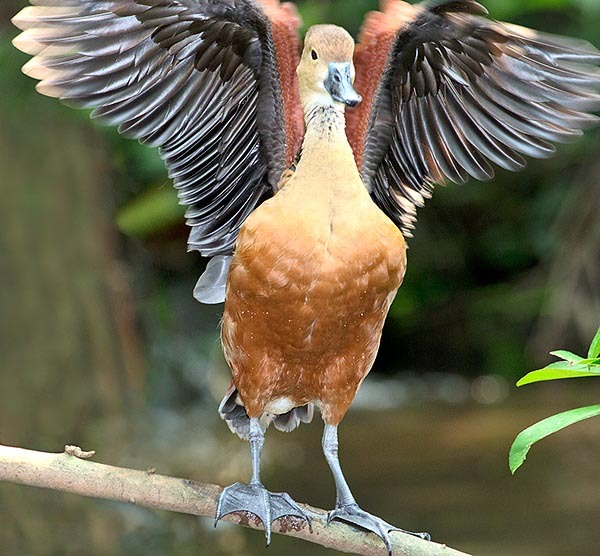 The whistling ducks have a peculiar conformation: fairly long necks and paws, ample webbed feet equipped with robust and sharp nails. They have a quite erect posture, with more verticalized trunk than the other ducks, their gait very “raised from the ground” is elegant and graceful. Short, wide, wings, rather roundish with primaries and secondaries having the same length do characterize all the species. In some of them, the inner vanes of the outer primaries have jagged and serrated shapes; they vibrate while flying generating a distinctive whistle or mechanical buzz. When flying, these ducks keep head and neck somewhat lowered and expanded ahead, the posture is rather humpy; the paws, long (more than the tail), simulate a long and pointed tail. They have a flight with rather slow and deep wing beats; the flight is rather flickering and very graceful. Many species fly also with the dark. The Indian whistling duck is the smallest species of the genus and weighs about half than the biggest member (450-600 g at the maximum). Its length is of about 36-40 cm and its wingspan is of about 70-74 cm. It is a duck with delicate and elegant appearance. 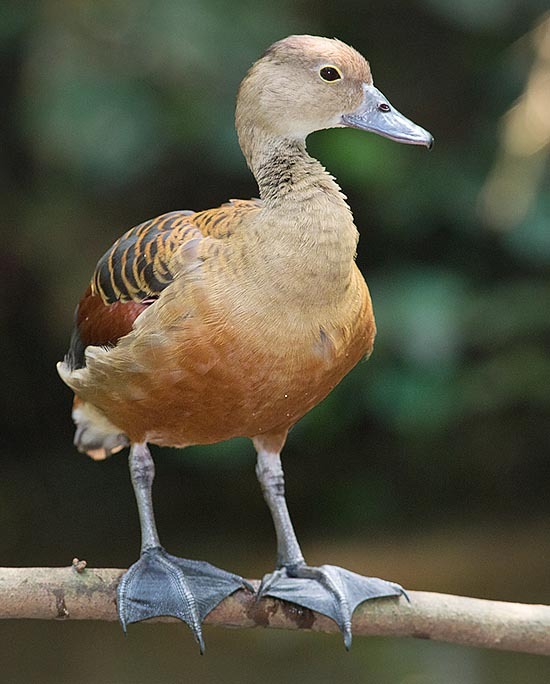 Its colouration renders it overall resem- bling to the “cousin” Fulvous whistling duck (Dendrocygna bicolor), but in addition to being smaller, it presents the upper coverts of the tail (rump) of reddish chestnut colour instead of white cream. The general colour of the livery is brown-reddish; the dorsal coverts are dark brown edged of reddish brown. Reddish are also the small and medium coverts of the wings. The remiges, the rectrices and the under-wing are of uniform dark brown-blackish colour. Laterally, face and neck are more shaded of leather yellowish colour. The vertex is of a little darker brown colour and this colouration may prolong, gradually fading, along the dorsal neck. The sides have reddish tones similar to those of the upper-tail on a base shaded of pale brown especially distally. The eyes of the Indian whistling duck have brown-dark irides and their sweet appearance is accentuated by thin palpebral rings of pale yellow colour. The paws and the bill are grey-dark slate bluish. The sexes are similar. It is a very elegant species with docile behaviour and almost confident. This duck vocalizes very much, averring noisy, particularly when flying; their flight is described as weak or slow. When they are scared, these ducks usually fly away without going too far and coming back where they were once the danger is gone. This whistling duck can nidify at a considerable distance from the water even if the trees and the vegetation growing close to zones of backwater, and which grant suitable hiding places for the nests, are by sure their preferred habitats. Although having crepuscular habits, they can feed during the day as well as during the night, in relation with the degree of disturb of the feeding zones. 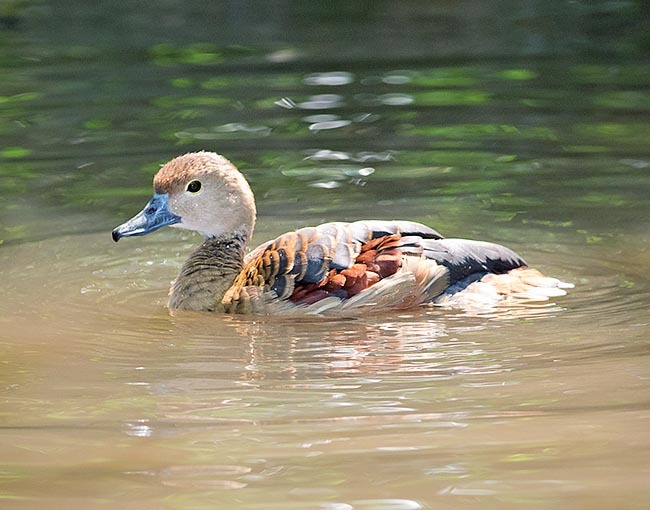 Like other whistling ducks, this species shelters and rests perching on branches of on partially submerged trees, or growing close to the water, or taking advantage of islets; the presence of these elements in proximity to the feeding zones is an important factor for the distribution and the presence of the species. The Indian whistling ducks, outside the reproductive period, can live in flocks of 20-30 birds or gathering, especially in the Indian territory, in huge flocks that may count even hundreds of individuals. They emit continuous low whistles which serve to maintain the specimens in touch among them; often, where the ranges are overlapped, they join anatids of other species such as the Cotton pygmy geese (Nettapus coromandelianus), the Wandering whistling ducks (Dendrocygna arcuata) and the Fulvous whistling ducks (Dendrocygna bicolor). 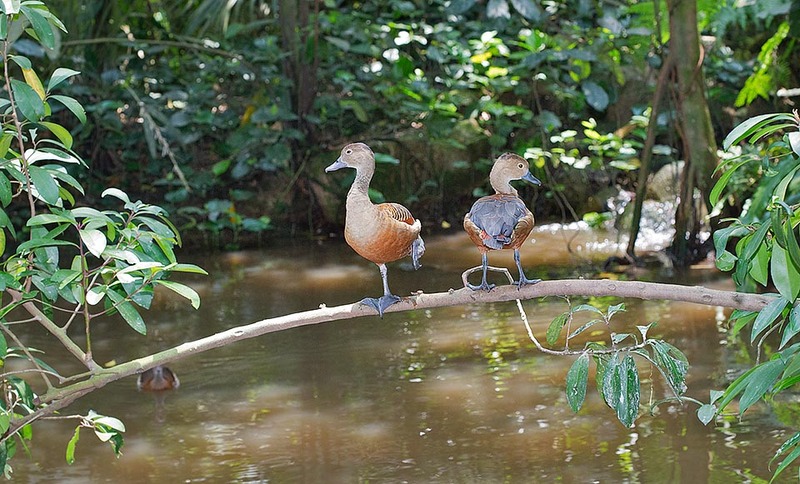 Like the other whistling ducks, it has an omnivorous alimentation; they eat among the thick aquatic vegetation, but their diet foresees a greater percentage of aliments of animal origin (than the other ducks). They abundantly predate small molluscs, especially snails, insects, frogs and other small animals. These ducks can nourish locally in the rice fields eating also the young buds of rice; this habit renders them often not appreciated by the countrymen. Perhaps due to the greatest quantity of aliments of animal origin, because of the rather unpleasant taste of their flesh, this duck is little hunted. These ducks swim keeping the body low on the level of the water so much that the neck appears even longer. The reproductive season is fairly ample and is ruled by the rainfalls; the peak of the spawning occurs in coincidence with the humid summer season. The Indian whistling duck is not particular about the sites of nesting as it can build its nest on the ground amidst the marsh vegetation (reeds, rushes, sedges), in low bushes, in forks of branches, in hollows of trees; at times are also utilized abandoned nests of crows, herons, cormorants, storks or raptors. The hatching is formed by 7-14 ivory white-cream eggs which are cared by both parents. Nests hosting more eggs may be fruit of intraspecific parasitism. The brooding lasts about 23-26 days. The ducklings have a regular brown-black and whitish mottled colouration with the white zones at the level of head, eyebrows, wings and back. The Indian whistling ducks are very attentive parents and can trample the vegetation close to the water in order to allow their own kids to rest in group gathered close to the water itself. The young of the year have a dull colouration if confronted to the adults. Even if the species is overall abundant in most of its range, some insular populations result being vulnerable. Flocks of hundreds of thousand of individuals were described in between the 19th and the 20th century, when the ducks were sold by thousands in the markets of Calcutta, Singapore and Saigon. The big storms now present in the Indian continent do not appear to reach the vast concentration described in 1800. The global population is estimated to be of 100.000 or more specimens. Though these ducks are enchanting and delicious to breed, they are after all not, inexplicably, so much diffused among the amateurish breeders. The species is endangered by the loss of suitable habitat, by the poaching and by the urban sprawl; particularly endangered is the population of Singapore. Fortunately, on the other hand, the species well adapts to suitable artificial habitats created by the man, like, for instance, the artificial small lakes of the parks. This species has a life expectancy of 10 and more years.